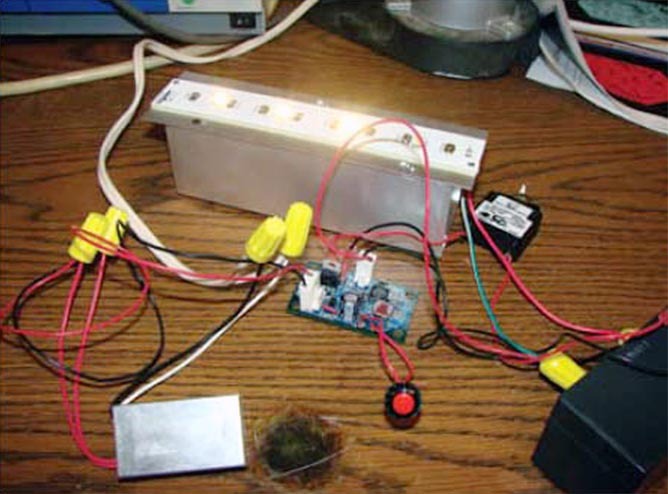 Power three to six LEDs from an ac- or dc-power source and charge a backup battery. LEDs find wide use in emergency lighting because of their high efficiency and control simplicity. The circuit in provides a highly efficient and reliable design for emergency LED lighting at 3 to 6 W. The circuit's input is 12 V ac, which the full-wave bridge rectifies and one or two capacitors filter into dc. The battery (not shown) is a 12 V lead-acid type. IC1 compares the battery voltage to the supply voltage. When the rectified voltage drops below the battery voltage, the battery takes over to provide LED power. The circuit has some small switching losses, which should be acceptable as long as IC2, a 12 V PB137 battery-charging circuit from STMicroelectronics, keeps the battery from draining. If this switch-over is unacceptable, add a 470-µF electrolytic capacitor to filter the input voltage to maintain a certain level above the battery voltage. Note that adding this capacitor lowers the power factor. Figure 1. This circuit converts ac voltage to dc voftage, charges a battery, and drives LEDs from the ac source or the battery. To get 12V ac, you can use an electronic transformer. These transformers provide 12V at a higher frequency, so a 10-µF capacitor can hold the voltage high as well as provide a high power factor. IC1, a Linear Technology LTC4412, controls two external PFETs that create a near-ideal diode function for switching between ac and battery output. The PFETs' voltage drop is only about 20 mV compared with a normal 0.7V diode-voltage drop. Pin 5 is low when ac power is off, so you can use this pin to turn on a warning LED through another PFET. IC2 has an internal current limit of 1.5A. Resistor R1 limits IC2's input; when the current reaches a certain level, Q4 turns off the charging circuit. This IC does not require reverse-diode protection. IC3, an LT3517 LED driver from Linear Technology, acts as an inverting buck-boost converter because the input can range from 8 to 17V for rectified ac. R10 sets up the LEDs' current. Because the voltage drop from each of the three LEDs varies from 3 to 4V, the IC's output voltage can be higher or lower than its input voltage if all 300-mA LEDs connect in series. By connecting a resistor divider, including a photocell, to the analog-dimming pin, Pin 8, you can achieve some dimming, which results in some power savings at higher ambient light. You can use IC1's Pin 5 to turn on a transistor or an optoisolator to pull IC3's control-pin voltage lower if you need to dim the LED when ac power is out. Resistor R7 programs IC1 to operate at 1 MHz. The circuit's efficiency is 82% when you power it directly from the ac power supply and about 70% from an electronic transformer. With a few minor changes to the circuit, you can add LEDs. For example, you can use Linear Technology's LT3518, which is a pin-to-pin-compatible version of the LT3517 but with a higher switching-current limit. You may need to adjust the feedback-resistor pair R8 and R9 for higher output voltage. You may also need more input-filtering capacitance to hold up the voltage. Tests show that the circuit can power as many as six LED in series. Figure 2. LEDs provide enough light for emergency lighting.